The district and the union talk about the next steps after teachers in the Denver Public School District voted to strike for the first time in 25 years. "The members have spoken and we’ll be going back and preparing teachers since we haven’t had a teacher strike in 25 years," Gould said Wednesday morning. "That’s our first question - what do we do, how do we make this happen? At the same time, our negotiations team is going to be ready to go whenever Susana [Cordova, the DPS superintendent,] is ready." One of the major sticking points for teachers that led to the strike vote was base salaries. DPS is offering $26.5 million in raises – something that district Superintendent Susana Cordova has said averages out to around 10 percent per teacher. But the union is asking for an additional $8 million, which they say is just 1 percent of the district’s budget. When talking strictly about money, Cordova said the proposals were about $8.5 million apart, but she added when other factors were considered things get more complicated. "There's some significant differences in proposals we've put together. From the district perspective we want to make sure we continue to reward the teachers who work on our title 1 schools and in 30 of our highest poverty schools," Cordova said Wednesday. "When we look at that difference it puts the proposals over $16 million apart." The union's priority is base salaries. DCTA has said they would like to see that additional money put toward that instead of bonuses, which it argues can be unpredictable. "You might have heard [DPS] talking about highest priority schools, DCTA really believes that money should be put toward base salaries for teachers, instead of bonuses or one time incentives which are pretty unpredictable and difficult to live with," said Becca Hendriks a teacher and union negotiator who appeared on 9NEWS Wednesday morning. The bargaining also included simplifying the pay system and providing a clear way for teachers to earn incentives. "Denver teachers no longer want to be subjected to an unpredictable pay system overloaded with one-time bonuses and incentives that are outside of educators’ control and that change in size and availability year-to-year," DCTA's statement reads. "The uncertainty in take-home pay from one year to the next does not make Denver an attractive place for teachers to settle in and plan their careers, and raise their own families." After the strike announcement, Cordova said the district remained committed to reaching an agreement with teachers and to keeping schools open. On Wednesday morning, during an appearance on 9NEWS, Cordova said she would be meeting with Gov. Jared Polis later in the day. "From our perspective, we think it's going to be very important that the governor consider how he can support the ongoing conversations to get us to an agreement," she said. "We think it's in everybody's interest for school to not be disrupted and for us to be able to make sure our teachers are in classrooms on Monday." Gould, the chief negotiator for the teacher's union said Wednesday they were waiting to hear from the governor but had been in touch with the Department of Labor. They formally requested the department's intervention Wednesday afternoon. "We really hope the governor recognizes we have a problem with teacher retention in Denver and that we’ve been trying hard to negotiate something that will work for our teachers," said Hendricks, a teacher who spoke on 9NEWS Wednesday morning. "We really do need a major change and I hope that he [the governor] recognizes that." Hours before the vote on Tuesday, DPS assured parents that schools in the district will stay open for the "foreseeable future" regardless of the strike. On Facebook, the district said that all services – including bus transportation and school meals – will be offered as normal. "Our commitment to our community is to continue to serve our students," Cordova said Wednesday. "It is so critically important. We have many children who truly depend on the Denver Public Schools both for their education for their well being." To do it, the district plans to use an existing pool of 1,200 substitutes and recruit others, as well as expedite the licensure and interview process. DPS has also been recruiting federal furloughed workers and has said it plans to pay substitute teachers double in the event of a strike. On Wednesday, Cordova confronted whether or not that was sustainable. "No," she responded. "And the most important thing we can do is work with our teachers to get an agreement. I think everybody realizes the best solution is for us to find the pathway to agreement. The most important thing for our students is to have their teachers in their classrooms, and that's our goal." Teachers though, at least according to the union, appeared ready to dig in for as long as it takes. "We at this point, we need to go as far as it takes," said Hendricks. "It's a dire issue. We're losing teachers at an incredible rate. So I think it’s an important time to take a stand. So, personally, I would say as long as it takes - we’re willing to do. It's really important for the future of our profession. It's really important for our students. And I think we’ve got the backing and support to make this happen." While teachers have the right to strike in Colorado, the state reserves the right to intervene although it can't force either side to do anything. If the Colorado Department of Labor and Employment doesn't intervene - which DPS has asked for as of 2 p.m. Wednesday - teachers would be allowed to strike as soon as Monday, Jan. 28. RELATED | What would a state intervention look like? When asked about the possible strike on Sunday, Polis was careful not to take sides but hoped for a resolution without the state getting involved. Before pitching lawmakers on his free full-day kindergarten payment proposal, Gov. 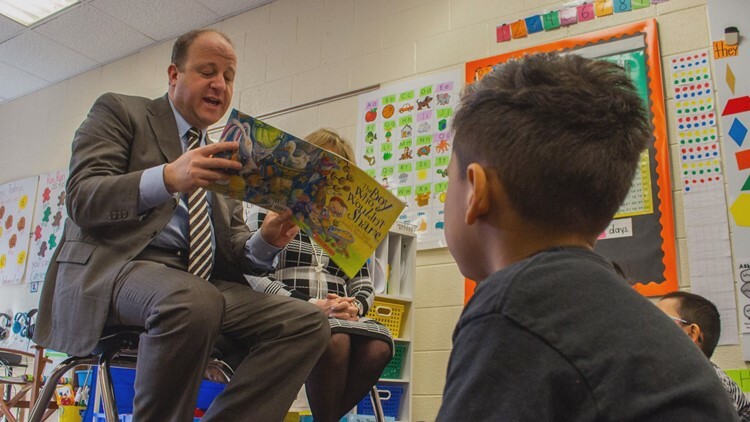 Jared Polis (D-Colorado) took his plan straight to kindergartners. Polis hadn't responded to the news of the strike at the time of this writing. According to the district, candidates must have a three-year substitute authorization, Initial or Professional License or a five-year substitute authorization from the education department.